Charlie's Bar has been part of the landscape in Somers Point since Charlie Thomas opened it as a classic corner bar in 1944. These days, it's the fourth generation of the Thomas family who carries on the corner-bar, 'CHEERS' atmosphere only with a whole lot more! 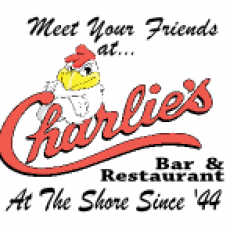 Charlies is not just a bar, it's a full service restaurant as well, serving up some of the regions most famous wings & a full range of American cuisine from seafood, to prime rib to southwestern.